Ruth Galene, who has died in Sydney aged 87, had an extraordinarily diverse career in dance. Born Ruth Helfgott in Berlin of Polish-Jewish parents, she came to Australia in 1938. The family settled in Sydney and Ruth’s first formal dance experience was with Viennese émigré, Gertrud Bodenwieser. After a successful audition, when she wore, as she recalled, a white silk dress that floated as she moved, Ruth began modern dance training under two of Bodenwieser’s leading dancers, Evelyn Ippen and Bettina Vernon. Shortly afterwards, Ruth began taking ballet classes in Sydney with Estelle Anderson and a little later with Lorraine Norton and then Leon Kellaway. 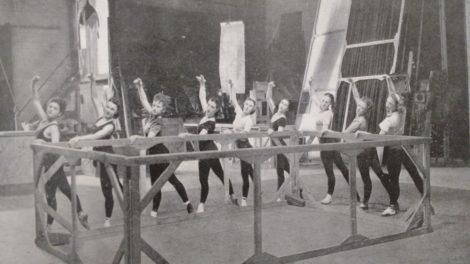 Ruth performed briefly with the Borovansky Ballet, where she counted star dancer Kathleen Gorham as one of her closest friends. She then joined the English company, Ballet Rambert, during its Australasian tour of 1947–1949, as indeed did Gorham. With Rambert, Ruth danced under the name Ruth Boker. Boker was a family name and Ruth chose it in preference to Marie Rambert’s suggestion of ‘Sylvia Sydney’. Her most successful role with Rambert was the principal one of the Italian Ballerina in Antony Tudor’s Gala Performance, which she performed in the company’s final season in Perth in 1949. While performing with Borovansky and Rambert, Ruth continued working towards the Royal Academy of Dancing examinations and passed Advanced with Honours in 1948 and then successfully completed the Solo Seal exam. In Europe, as well as dancing with Roland Petit’s company, Ruth performed with Le Grand Ballet du Marquis de Cuevas. It was choreographer and ballet master of the de Cuevas company, John Taras, who suggested she change her name (again). She consulted with renowned dance writer Cyril Beaumont and chose Galene after the Russian ballerina Galina Ulanova. With de Cuevas she had the opportunity to dance the works of some of the twentieth-century’s most exciting choreographers, including Léonide Massine, Bronislava Nijinska, Jean Babilée, George Skibine and George Balanchine. Back in Sydney Ruth began teaching, having bought a school in Northbridge. She also began to branch out into choreography in a major way. She created The Tell-tale Heart, with a commissioned score by Nigel Butterley, for the inaugural performance of the Sydney-based choreographic ensemble, Ballet Australia, in 1961 and went on to make several more works for this company. They included Adagio Albinoni in 1967, which she always regarded as a breakthrough work in which she was able to combine classical and contemporary vocabulary. Adagio Albinoni was subsequently taken into the repertoire of the English company, Ballet Caravan. In 1969 Ruth began formulating her system of dance training, Dance Dynamics, which she worked on for some thirty years until 2000 when she felt it had developed into a comprehensive system. She described it as having a movement vocabulary that was ‘integrated with key elements pertaining to the Australian natural environment’. During this time she established the New Dance Theatre, renamed in 1989 as Red Opal Dance Theatre. With this company she aimed to create works that demonstrated a distinctive, Australian identity. She created over 100 works for her company, often using original scores by Australian composers. Red Opal Dance Theatre and its predecessor performed across various Sydney venues and in regional areas in New South Wales from 1967 up until 2005. Ruth Galene is survived by a son and daughter-in-law, Robert and Christina Frank, and three grandchildren. ← Previous post Ausdance National. Where to now? Thank you for your thoughts. I was lucky to meet Ruth through a commission to record an oral history interview with her, which I enjoyed immensely. I also remember as a teenager taking a class with Valrene Tweedie, which Ruth also took, although she was a professional and I was still a student! But it was fun being in class with her. Thank you for this tribute. Ruth was my first dance teacher. I was eight years old. Dancing for me then, was whatever I made up, as I danced in the living room, to a record, usually Swan Lake. Her teaching of technique was something new, very precise, even strict, and I admit to being terrified and in awe of this elegant, extravagant and eccentric woman. I am writing a doctorate in dance education now, and she features in an auto-ethnographic section of it where I interrogate my history as a student and teacher. I recall the post-class conversations, when we were the ‘older’ group, the main theme of these conversations was connection; between art and life and philosophy and the value of the creative and expressive. As it turns out this was my first taste of the reflective process, blurring the body-mind binary. At the time, as a teenager I was sometimes concerned about the attention she drew to us; she would sweep into a performance venue, the total artiste, in a fabulous flowing fake fur coat, kissing the air and stirring up the energy in the room. In retrospect, no matter my current views about dance and dance pedagogy and the place of art in general, she remains a significant personage in my dance and non-dance life. Thank you for such a touching, insightful and personal comment. Listening again to the oral history I recorded, and I went back to it when writing the obituary, I am not surprised that you found her teaching ‘strict’. She was I think someone who was so immersed in what she believed that there was no room for being a dilettante. All or nothing.